The National Investment Banking Association (NIBA) was proud to host its 143rd investment conference on March 26-27, 2018 at the Westin New York at Times Square in New York City. Are one-and-a-half day fast-paced intimate events showcasing public and private companies, regardless of size or industry, who are actively seeking to raise capital and/or to raise their profile in the investment community. Videos of the NIBA 2018 March New York Speakers Seth Farbman, Chairman, VStock Transfer LLC “How Companies Can Benefit From LinkedIn,” David Feldman, Partner, Duane Morris, LLP “Regulation A+ At A Glance,” Edward Fitzpatrick, ISEG Limited “I Am Here To Make You Money,” and Clint Arthur, Clint Arthur TV “Be A Celebrity in Your Customer’s Eyes” have been posted on the NIBA Blog. These videos are also available on our NIBAVideo YouTube channel. Harbor City Digital Ventures, Inc. The Westin New York offers a refreshing hotel experience in the heart of Midtown Manhattan. 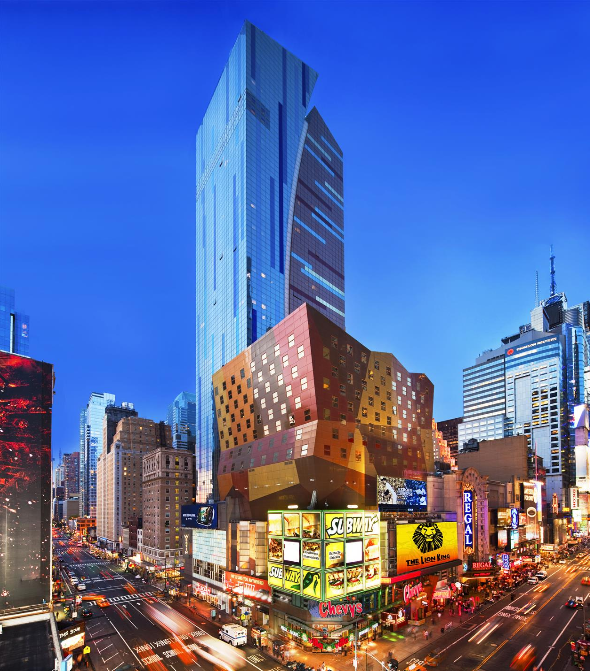 The impressive 45-story tower distinguishes this 873-room landmark hotel located in the heart of Broadway – within walking distance of 40 theatres and world-famous shops and restaurants. Luxurious rooms and suites feature Heavenly Beds® and Heavenly Baths®. Guests can take advantage of the indoor parking garage located across the street where Westin Guests will be offered preferred pricing if staying at the hotel. Guests can shape up in the WestinWORKOUT® Gym, or stroll from the lobby into E Walk®, a 200,000 sq. ft. retail, dining and entertainment complex. Within walking distance to 40 Broadway theaters & Restaurant Row. Close to spectacular sights & New York City’s most famous landmarks. Easy to Access subway system, Penn Station and Grand Central Station. Surrounded by New York City’s fashion and financial districts. Convenient to all New York City’s airports. Contact: Sarah Cirelli, 5 Bryant Park @ 1065 Avenue of the Americas, New York, NY 10018. Telephone: 212-790-5740. 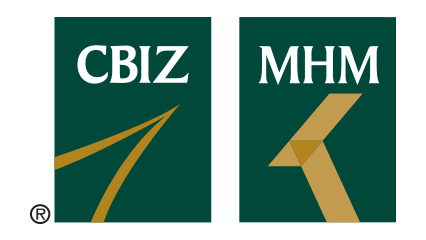 Email: SCirelli@CBIZ.com. Edgar Agents® is a top-rated, full-service financial filing and printing firm that converts financial documents into EDGAR® and XBRL formatted files and files them directly with the SEC. We also offer newswire, financial typesetting and printing services, among many other value-added services. Since 1997, Edgar Agents® has been transmitting documents with the SEC and is one of the fastest growing EDGAR®/XBRL filing businesses in the market. With clients all over the world, our staff consists of highly trained individuals with degrees in various industries such as accounting, business and technology. Contact: Steve Yakubov, 207 W 25th Street, 9th Floor, New York, NY 10001. Telephone: 212-265-3347. Email: steve@edgaragents.com. The Giordano Group, Inc., Div Network 1 Financial Securities is a capital markets advisory and consulting firm. Life Science Practice securities offered through Network 1 Financial Securities, Inc. Contact: Robert Giordano, The Giordano Group, Division of Network 1 Financial Securities. Telephone: 917-327-3938. Email: rgiordano@netw1.com. Contact: David Feldman, 1540 Broadway, New York, NY 10036. Telephone: (212) 692-1036. Email: DNFeldman@duanemorris.com. Issuer Direct® is an industry-leading communications and compliance company focusing on the needs of corporate issuers. Issuer Direct’s principal platform, Platform id., empowers users by thoughtfully integrating the most relevant tools, technologies and services, thus eliminating the complexity associated with producing and distributing financial and business communications. Headquartered in RTP, NC, Issuer Direct serves more than 2,000 public and private companies in more than 18 countries. 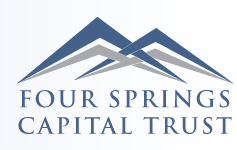 Four Springs Capital Trust is an internally managed real estate investment trust focused on acquiring, owning and actively managing a portfolio of single-tenant, income producing retail, industrial, medical and other office properties throughout the United States that are subject to long-term net leases. Contact: Chris Neary, 1901 Main Street, Lake Cuomo, NY 07719. Telephone: (732) 749-7353. Email: cneary@fscap.net.